Why is my cat giving me such a look? Probably because I’m not paying enough attention to her. And what could me more important than pampering the cat? This year, I promised myself I was going to do something for myself and for others: I’m going to participate in the Walk MS Chesapeake Challenge. This event is 2-day, 30-mile walk that supports the National Multiple Sclerosis Society. Money raised goes to support research, advocacy, and services for those affected by MS. I have a page set up there for donation sponsorships, and I’m hoping a few of you will help out. Why am I doing it? Aside from a need to get off my rear and and get some good exercise for a change, it’s to support a good cause. Our lives have been touched by MS. My husband’s mother suffered from very severe MS symptoms and was housebound for years. By the time I met her she was about to get out and about (with assistance) thanks to new breakthroughs in treatment made possible by ongoing research efforts like those at the MS Society. Sadly, she passed away before she ever became my mother-in-law; I have a friend today who benefits from even newer treatments who will hopefully never go through what she did. Because this is such a large event, I need to do fundraising on a scale I haven’t tried before. For that I’ll need your support. And just in case the warm glow of making a tax-exempt donation to a very worthy cause isn’t enough, I’m sweetening the pot a bit. 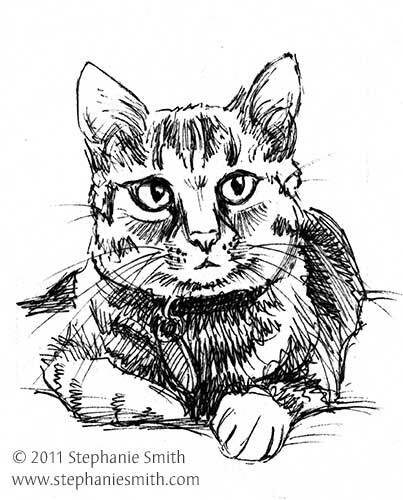 For a $40 $30 donation in my name, I’ll draw a quick sketch of your favorite pet (similar to my cat above) from a photograph you provide, and e-mail you a digital file ready-to-print. This is a picture of one animal… all pets welcome! See below for some samples. For a $60 $50 dollar donation, I’ll do the same as above, AND mail you the signed, original sketch. 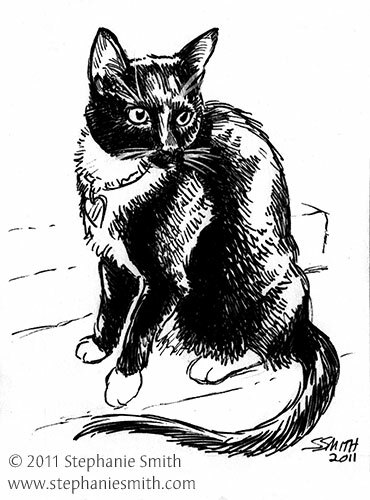 This is a small, 5×7-inch drawing, perfect for a standard snapshot picture frame. How can you take advantage of this amazing offer? Just go over to my donation page at the MS Society website and make a donation in the appropriate amount. Be sure to include your name on the donor list so I can confirm your donation and put e-mail address in the “Personal Note” section — I need it to send you information on how to get your drawings! So I don’t go insane trying to draw everything! What if I have more than one pet/there’s more than one pet in the photo? Additional pets in the same picture require an additional $10 per pet. If you want two separate drawings, the second one would be an additional $30 $20 for digital only, $45 $35 for the original artwork. What kind of sketches are we talking about here? These will be black-and-white drawn with archival inks on bristol paper, and may include inkwash. Yours will be signed, but won’t have the extra text on it that you see here. They are sketches and studies, in addition to the sample above, there are some more samples below… and more on the way. How do I get my sketch? After your donation is received, I’ll send you an e-mail with the details, but in short you’ll need to send me your address and a good, clear photo of your pet, either by e-mail or by post, and I’ll take care of the rest. When will I get my sketch? No later then the end of the July, probably earlier. I need to spend as much time as I can before the walk getting into shape for it, so I may not start any of the drawings until afterwards. Your favorite photo of your pet! I prefer if you can send a picture that was taken with natural lighting rather than a flash, but I know that’s not always possible. I can’t draw details that I can’t see in the picture, so keep that in mind. Can I use my drawing on my website/as my logo/in a book? Donation incentive drawings are intended for personal use only. I can provide a release letter if your local photo printer requires one. You can include it on your personal webpage but I ask that you include a link back to my website stephaniesmith.com. If you want to publish the image commercially — or you’d like to commission a custom illustration — please contact me and we’ll talk. Is the MS Society site safe to use? Where are those sample drawings you mentioned? Any other questions? 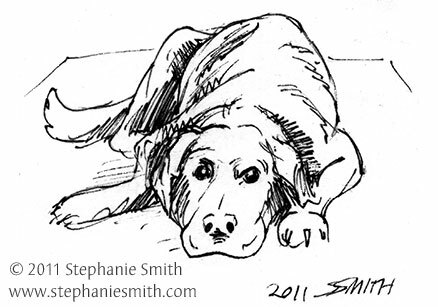 Drop me a line at contact@stephaniesmith.com… and thanks in advance for your support! This entry was posted in Scribbles, Scribings by stephanie. Bookmark the permalink. What a great idea! Too bad we can’t decide on a “favorite” pet (least annoying?) Good luck on the walk. You can come up here and train on the Hill. Pingback: Scribbles & Scribings » Blog Archive » Sketchbook time!